“That’s awesome” was how former five division world champion and reigning WBO super bantamweight champion Nonito “The Filipino Flash’ Donaire reacted when we informed him of his choice as one of three “Athletes of the Year’ chosen by the Philippine Sportswriters Association led by its president Rey Mallari, sports editor of the Manila Standard. Named alongside Donaire was Donnie “Ahas” Nietes, the longest reigning Filipino world champion who is king of the WBO light flyweight division and young golfer Miguel Tabuena, winner of the prestigious Asia Tour. For their triumphant campaigns, the three will share center stage on Feb. 13 when the Philippine Sportswriters Association honors them with the prestigious Athlete of the Year award during its Annual Awards Night presented by MILO and San Miguel Corp. at One Esplanade in Pasay City. It marks the first time in the last three years that there will be multiple awardees for the coveted title bestowed by the country’s oldest media organization on deserving athletes and teams, who made their mark during the year. Donaire, lady boxer Josie Gabuco, Team Manila, and the Ateneo Blue Eagles shared the Athlete of the Year honors in 2012. This is the fourth time Donaire (2007, 2011, 2012) will be feted by the sports-writing fraternity with the same award, while it will be the first for both Nietes and Tabuena. The 33 year old Donaire who makes the first defense of his newly won title against Zsolt Bedak of Hungary on April 23 at the Smart Araneta Coliseum, thanked the PSA president and the members for the award which he indicated meant so much to him as he begins a determined effort to recapture the glory years of his career when he was named “Fighter of the Year” in 2012 and was No. 5 in the Ring Magazine pound for pound rankings with a run of four smashing victories against the best super bantamweights at that time. The soft spoken Nietes started the year by becoming the longest-reigning Filipino world champion after surpassing the long standing record of seven years and three months and ten days held by the late great world junior lightweight champion Gabriel ‘Flash’ Elorde. In a commendable gesture Nietes flew to Manila shortly afterwards to visit Elorde’s widow Laure Elorde in her Paranaque home and then paid his respects at the tomb of Elorde at the Manila Memorial Park. Ms. Elorde was touched by the gesture and praised Nietes not only for his achievements but more so for his humility which reminded her of her late husband. Nietes is expected to defend his title in late May against mandatory challenger Moises Fuentes of Mexico which was ordered by WBO president “Paco” Valcarcel despite the fact that Nietes dropped Fuentes three times in their last meeting to win by a rousing 9th round knockout. 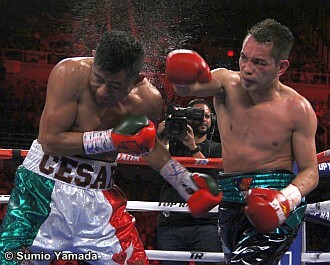 Photo: Donaire (R) tags Cesar Juarez with a right during their fight of the year candidate fight last month in Puerto Rico.